The Paragon Federation <TPF> was the first online guild I ever helped create. In the aftermath of RobotConstructer’s abrupt departure from Grandor, we knew a new direction was needed to keep the group from imploding. The official Paragon Federation website and forums were opened by Sid Xer on November 26th, 2002. TPF had over 50 members in its initial establishment but a disagreement among members would take place months afterwards. About 30 members would follow Jarel Elus (formerly Jaron Elus) to create Crimson Republic. They would seek to be independent but stay the course as a Rebel faction. The Paragon Federation, in its prime, was one of the great economic powerhouses on Chilastra and a major part of the construction process of Crystal Valley in the Winter of 2003. The classic Paragon Federation banner in 2004. Dak’n Tarin (Councilor) 12/02/02 – graphics artist, ran Grandor Mining Inc. The official mission of The Paragon Federation was to build Grandor City. That was the priority above all else. It was why we were there, over a year after the prophecy of Grandor was foretold. TPF would eventually play a major role in constructing Crystal Valley on Dantooine in the month of December 2003. 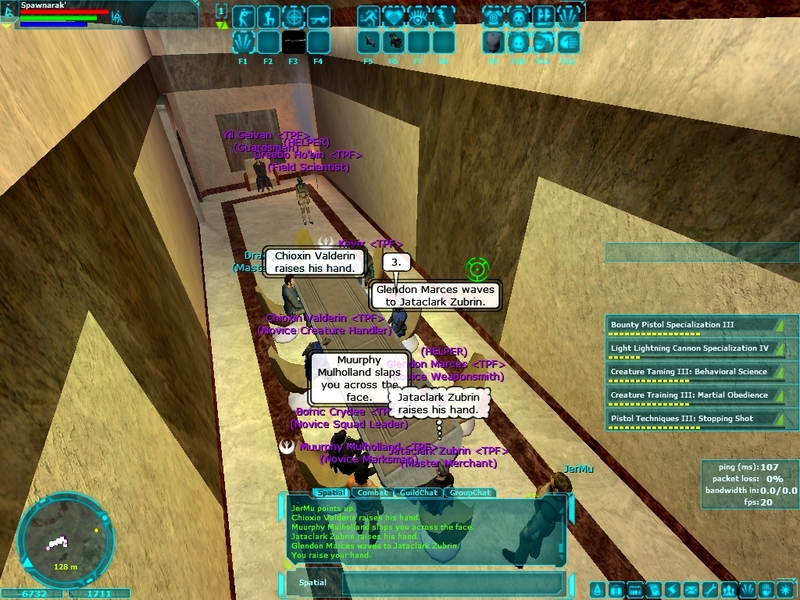 With the help of Crimson Republic and the short-lived Exodus, it became the first Metropolis-ranked player city on Dantooine and dominated the landscape for a few months, exploiting the high amount of traffic to the Force Crystal Hunters Caves. Prior to the founding of Crystal Valley, players had to make an extremely long voyage through some of the more dangerous content in the game to reach these caves. In addition to that, the nearest cloning facility was also where the nearest shuttport was – over 11,000 meters away. It was basically on the opposite side of the map. The Paragon Federation fell into decline after Jarel Elus (mayor of Crystal Valley) quit the game and various people attended to real life affairs. On March 31st, 2004, the final closing announcement was made by Borg, the acting leader at the time. We had a good ride, but the time has come for TPF as we know it to end. We’ve changed our focus, and will now concentrate on being more of a gaming hangout then just a PA for Star Wars Galaxies. I want to take this time to thank all of the members and friends of TPF that helped along the way with making us what we were. We’ve changed our forums into more of a gerenal online gaming hangout. Take some time and look around :). The list of remaining active members was short. Yil Geivan (who merged Exodus back into TPF) and I were inactive due to real life. This was a period of my PA’s life that I wasn’t involved in, something I regret to this day. I never did return to Star Wars Galaxies after the Spring of 2004, and much of my screenshots and sources from that time were lost in a hard drive crash. The original Grandor group that led to the formation of TPF, CR, and EXO formulated a military chain of command over a year before the game actually came out. We were a little clueless on how mechanics worked so we just had fun assigning ranks and different branches in the military. TPF’s military leader was Sheu Millon, Crimson Republic’s military leader was BarenMordegan, and Yil Geivan would be the war strategist for Exodus. Later, he would work with BarenMordegan to plan military efforts concerning Crystal Valley. Hi I am Sheu Millon the Surface Marshal of The Paragon Federation and I would like to welcome you to our website. It is our goal at The Paragon Federation to have a military that is highly effective, highly efficient, and provides each member with the most enjoyable game play. It is also our goal to ride the evil imperial threat from our Galaxy and once again restore peace and harmony to the Universe. Squads have been formed as well as a couple promotions to PFC and Squad Commanders. Check them out in the members section. –Gotep Vegitunks has been chosen to lead first platoon of Abel Company and Spawnarak’ has been chosen to lead a yet unnamed squad most likely in 1st platoon of Abel Company. They have been promoted to Sgt. Major and a temporary rank of PFC respectively. -We currently are seeking military personnel to fill the officer roles in our military. Because we feel that the higher positions should be earned through game play and leadership, the position of 1st Lieutenant will be the highest starting positions in our military. TPF had many other branches of divisions but what set it apart from most other PAs at the time was its ambitions in commerce. Sid Xer offered a service to all prospective businessmen to start their own business website to operate in-game. All members of our PA who plan to operate and own a business in our city, Grandor, are offered free web space and email addresses. The only people eligible for web space are those who are going to own and operate a website are those who will own a business, no exceptions. This web space is offered to help give our merchants a presence on the web. This web space can be used to advertise for your business, take orders from customers, list products, or any other way to benefit your business. However the website must be used for your business. RobotConstructer’s dream did not die with his passing. I wasn’t able to play in the first month after launch but the guild had already started working on training through the different professions. Recruitment was ongoing and we would see new faces every other day. Players from TPF, like Hypo Crates, became the first to master his chosen profession on Chilastra. Master Doctor, in his case, and he was familiar with the process since Beta testing. Corellia would be site of our very first city. It contained the massive metropolis of Coronet and was considered the unofficial home of the new Rebellion Alliance. When I finally joined my friends in-game, we set out to find a flat stretch of land a few thousand meters from Coronet, the major city on the planet Corellia. However, this idea didn’t last long as there was little demand in the area for weapons and supplies. The level of the creatures on the planet was also considered beginner so there wasn’t much incentive to start the guild’s businesses here. Corellia was saturated with other PAs. Certain businesses like Stettin Palver’s X-Force Weapons were dominating the market. Player cities were technically not implemented in full yet (that update was released on November 13th) and there no ability for a city to grow its borders into a Metropolis. We only sought to find a good spot of land to place the deeds of our houses, to lay down the foundations for the future. Corellia was not the right choice for us and we decided to move on. Our next venture would be Naboo. It was RobotConstructer’s original plan for Grandor. It had a beautiful and mostly flat landscape but was primarily Empire-controlled. After finding a good spot a far distance from Theed, we laid down a guild hall and inaugurated our very first home. 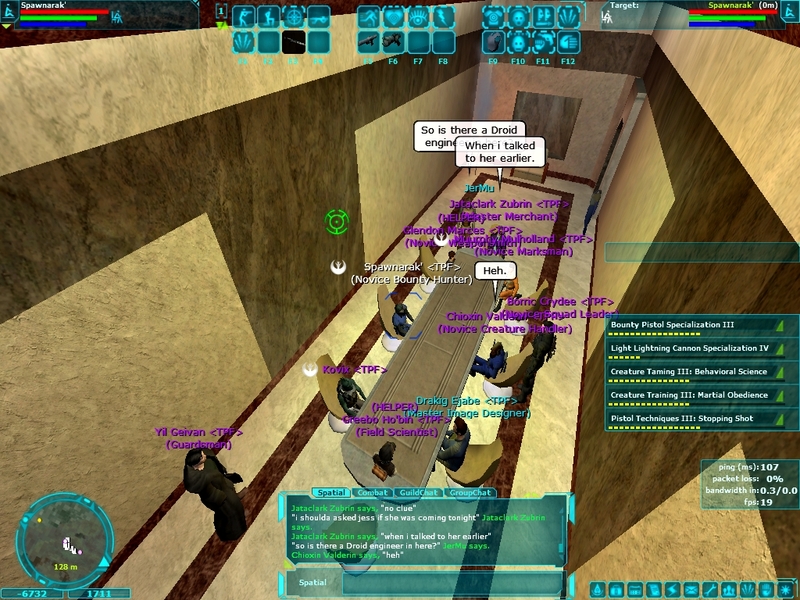 We also created the Grandor City Forum for Naboo on 9/15/03 specifically designed for communications between other PAs. Crimson Republic and Exodus began to work with us but it was still the early process. The long wait of development wasn’t kind to our numbers but we were getting the first taste of what we wanted to do for so long. We dubbed the settlement “Grandor City” in honor of our original mission. Taken on 10/25/03. 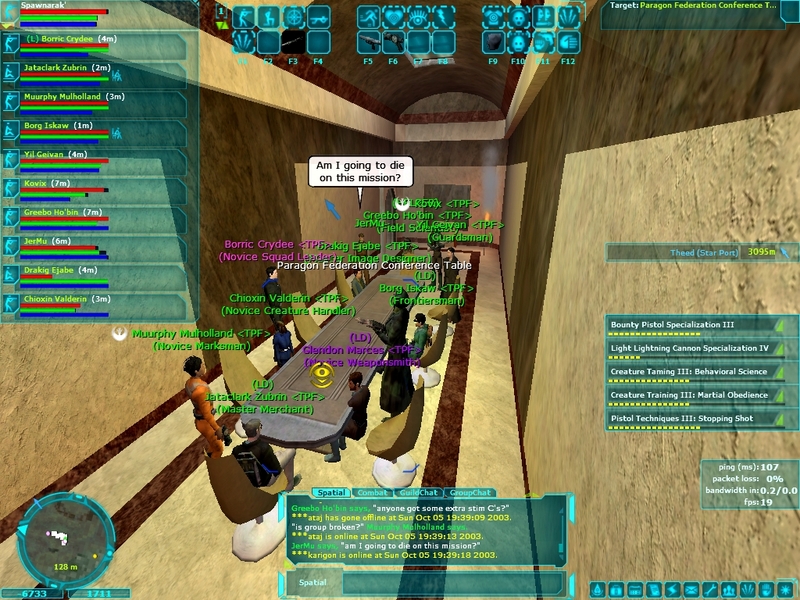 This was our first ever guild meeting in-game, and we had it inside the assembly room of Very famous people are in this picture. I still remember each of them like it was yesterday. Yil Geivan, pictured on the bottom left, merged his guild Exodus back into TPF. Yil was formerly named Dax and he was one of the original founders of Grandor. He is one of the oldest friends I have from that era, to this day. Jataclark, seated at the far end of the table, was one of the greatest Tailors on the server. His vendors attracted many players to Crystal Valley. In the PA itself, he played a major role in directing activities to the membership down from the council. This meeting contained many of the future leaders of TPF, such as Borg Iskaw. He would later become the guild’s final acting leader. We had our very first guild meeting within the PA hall and made important plans regarding the future of our association. During this period, Crimson Republic and Exodus, brother PAs of TPF, didn’t have much luck with their independent city projects. Some of the original founders of Grandor and I collaborated to return and use our combined numbers to our advantage. Those particular screenshots above will always hold a special place in my heart. They are the only screenshots I have left that contain this many old TPF members (including leaders) in the same location at the same time. The majority of my screenshots were lost due to a hard drive crash. Much of Crystal Valley in its final stages was part of that lost data. This was an impressionable period as I was growing up. Most of the guild wasn’t that much older and finishing up high school or just starting college. None of us had any prior experience in running a player association. 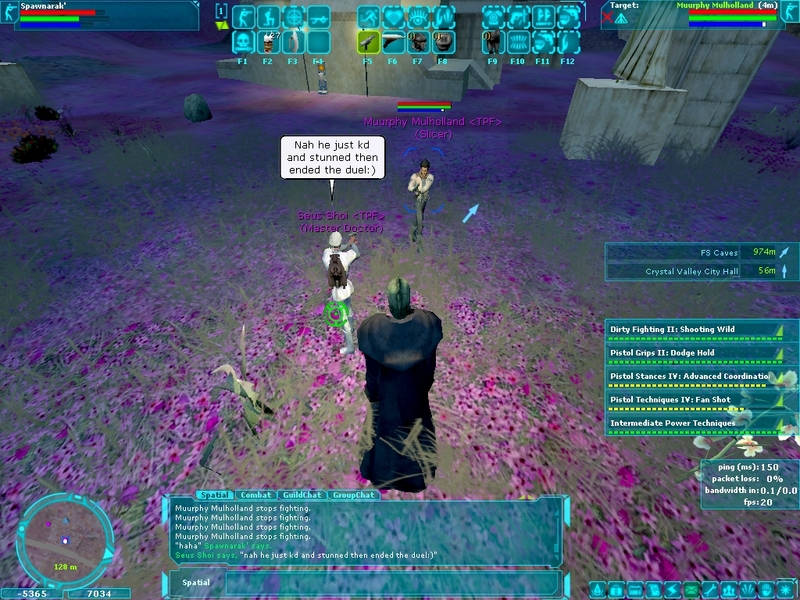 It was the first MMORPG for the majority of the SWG community. The beautiful part of this meeting was the fact that we were just a tiny group of players in a large universe. While we were sitting in this assembly room and discussing our futures, I thought of the battles that were raging on the other planets at the same time, the hunting parties that set out to the Krayt Graveyard, and guild meetings in other parts of the Chilastra galaxy. It put things into perspective that we were just small moving pieces of something far greater and yet we were making choices that would drastically affect what the future. Our decisions here shaped things that we could not yet see. It was a bit of an epiphany moment for me or maybe I was just young. In this meeting we confirmed the direction we would take in the Galactic Civil War. Seus Shoi in a duel vs Muurphy Mulholland in the center of Crystal Valley on 12/15/03. Seus Shoi ran the most popular medical supplies vendor in the Commercial District. Muurphy was the first player in TPF to reach Master Pistoleer, something he meant to do well before the game came out. Seus is referring to Muurphy using the knockdown + stun/dizzy order of attack, which forced the opponent into a permanent state of being knocked down. Changing posture while in dizzy state causes one to fall back down again. Our city was short-lived and we made the decision to abandon Naboo in light of the new Force Crystal Hunters Caves. Holocrons were the future. It was a new way to become a Jedi by mastering each profession commanded by the Holocrons. Once all tasks were completed, one would be on the way to unlock the Force Sensitive slot. With Crimson Republic’s Jarel Elus backing us at the time, we knew exactly how to exploit this new opportunity. Crystal Valley was not the city we originally envisioned but it would become what we always wanted – something that impacted the entire server that we were proud to have helped build.